Cut PDF pages into small pieces. Apply current operations to specific pages. Delete selected pieces or pages. Before using VeryPDF Advanced PDF Page Cut, please download the application and install it. This application supplies Windows version and Mac OS X version . The usage and interfaces of these two versions are the same, which means that if you can use Windows version, you will be able to use Mac version on your Macintosh. When you add PDF document into the application, you can use drag and drop operations or click Open button to open file picker window for choosing PDF document. The page thumbnails will be shown in the left preview panel and when you click on any thumbnail, the current page will appear in the middle panel. Please see the application interface in Figure 1. When you need to break PDF pages into pieces, you can click Draw vertical lines and Draw horizontal lines to manually draw cut marks. Or you can click Add a grid button to input the row and column number in popup dialog box to draw a cut grid in current page. Additionally, after adding vertical or horizontal lines, you can also adjust its accurate position by changing its percentage in Line Position edit box. The PDF pieces will be ordered from left to right or top to bottom. 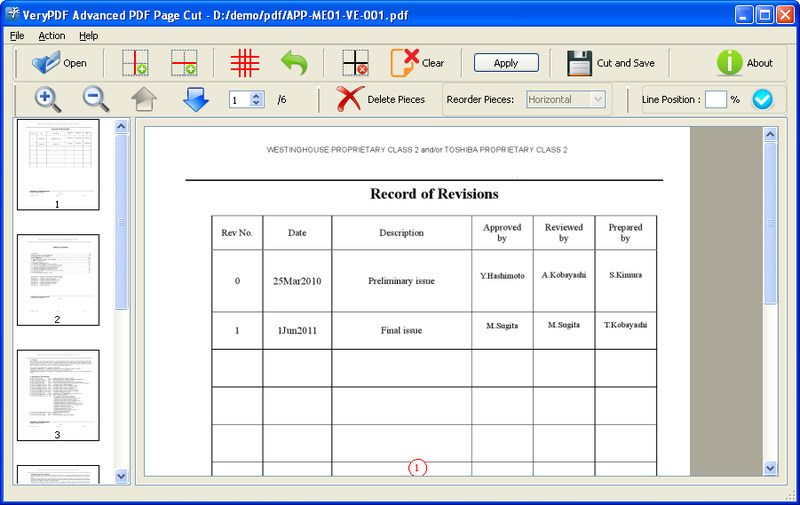 With the buttons Zoom in, Zoom out, Up and Down you are able to view added PDF document better. In order to delete the cut PDF pieces, please click the button Delete Pieces and the button will turn to Quit Delete. Please see it in Figure 2. You can choose any cut pieces and a big x mark will appear on the selected pieces. Then please click Apply button and in the coming out dialog, you can choose the pages that you want to apply the current operations to such as all pages, even pages, odd pages or specific pages. After clicking on OK button, all the chosen pieces will be deleted and all reserved pieces will be reordered again. For deleting PDF page, please don't break the current page into small pieces, and click Delete Pieces button to choose the whole page and click Apply button to apply the current operation to current page. If you don't want to apply current operations to other pages, you can make other changes in other PDF pages with the same ways. At last, please click Cut and Save button to open the saving window in which you can choose the output location and edit the file name for the new created PDF document. All the steps are available in both Windows and Mac OS X systems. 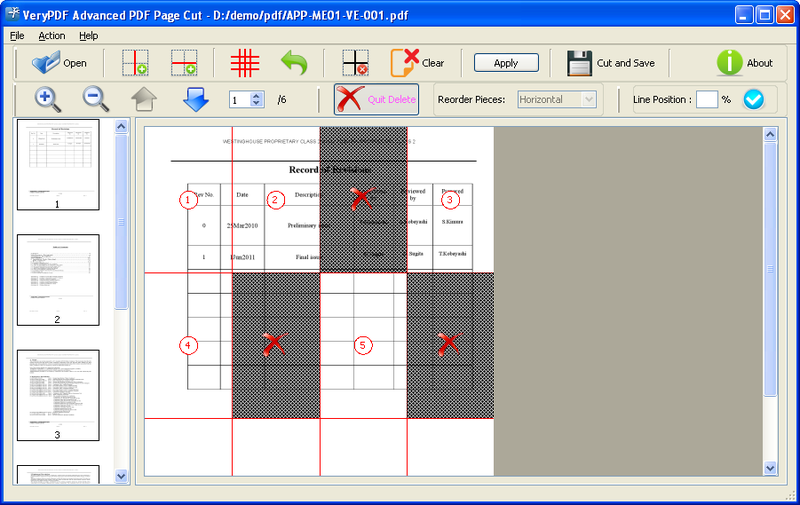 So if you can expertly use VeryPDF Advanced PDF Page Cut in one system, you will be able to master it in the other one. How to delete PDF page or cut pieces in Windows or Mac OS X? How to break PDF pages into pieces in Windows or Mac OS X? Convert PDF, Office files (Word, Excel, PowerPoint, etc. ), HTML webpages and images to flipbooks with animation and audio effects. It also support online publishing and sharing.